For a pack overnighter, at least one adult member must complete BALOO training. Make sure you bring a pen or pencil. When and where can I attend Cub Scout Leader Position-Specific Training? This one-and-a-half day course is designed as an introduction to the Cub Scout outdoor program for leaders interested in adding a camping component to their Pack activities. BALOO training consists of an online pre-requisite component in addition to an overnight hands-on practical. BSA’s Cub Scout level camping policies will be taught along with the discovery of the necessary tools to help units carry out a successful camping experience. Completion of this course is mandatory for a MINIMUM OF ONE adult on a Pack overnighter. All participants MUST complete the BALOO Prerequisite Training online prior to arriving in camp. Please note, if you do not complete this prior to the completion of the in-person segment, you will NOT be given credit for having completed this training program. The Boy Scouts of America requires Part A and Part B of the BSA Annual Health and Medical Record for ALL participants—in basic Scouting activities such as weekend camping trips less than 72 hours in duration. This does not require a doctor’s signature. Part B requires a copy of your medical insurance card. Training begins promptly at 8:00 am, please arrive early to check in. Your BALOO training experience will end at 11:00 am the next day. Participants must attend the entire program, including the overnight, to receive credit for attending. Please make arrangements for any children in your household as we will not have appropriate supervision and activities for youth while you are on course. No Walk-Ins, Online Registration Only. April 27, 2019 at 8:00 am to April 28, 2019 at 11:00 am at Camp Somers, Mount Allamuchy Scout Reservation. September 21, 2019 at 7:00 am to September 22, 2019 at 11:00 am at Winnebago Scout Reservation. Note: This is required training for all scoutmasters and assistant scoutmasters. The Troop Leader Guidebook, Volume 1 is required courseware and is available for purchase through the Scout Shop or can be available for purchase upon check-in for $13.00. There is no registration cost for Scoutmaster/Assistant Scoutmaster Position Specific Training, however registration is required. An enthusiastic, trained leader can make the difference between a troop that is struggling, and one that is ready to take on the world! This course will show both new and experienced troop leaders how to apply proven techniques for running an effective Scouts BSA troop. Pen or pencil and paper for notes. Wear your class A uniform if possible. When and where can I attend a course? Want an opportunity during the day? Check out the Scouts BSA Summer Camp tab. You do not need to be registered for camp to attend. The outdoor skills a Scout must learn in order to reach First Class rank, including First Aid, Building Fires, Cooking, Ropes-Whipping,Tying & Lashing, Using a Compass and Map, Working with Wood Tools, Identifying Plants and Animals, and lots of others. When and where can I attend? SM/ASM Position-Specific Training held at summer camps from 9:00 am to 12:00 pm and then 2:00 pm to 4:00 pm. Check in is at 8:50 am. The two hour break allows leaders to eat with their troops and be present during siesta. If you are attending summer camp with your troop, your noon meal will be with your troop. If you are not attending summer camp, you will need to bring a bag lunch with you. Registration for 2019 SM/ASM Position-Specific Training at Camp Somers and Winnebago Scout reservation is now open! This course will combine material for both Venturing Advisor Position-Specific Training and Crew Committee Position-Specific Training into one larger training session. Since portions of the course content for each of the two sessions is exactly word-for-word, the two courses have been combined to allow all attendees to receive credit for both courses. NYLT is the only council-wide youth training program that is not designed to be program specific. NYLT is a rigorous youth leadership training program that provides skills for life and is designed to benefit and enhance the leadership teams of Troops, Ships and Venture Crews. It is fun, challenging and informative. This is a co-ed course. This year Patriots’ Path Council will offer 3 courses. As of March 1, 2019, Scouts BSA members (male and female) must be at least 13 years of age but not older than 18 years of age. They must have completed Introduction to Leadership Skills for Troops. For 2019 only, an exception will be granted for Scouts registered in Scouts BSA to attend NYLT without first achieving the First Class rank. A registered Sea Scouts or Venture Scouts youth who is at least 13 but not older than 21 years of age. An NYLT course is set up to represent a month in the life of a typical Scouts BSA troop, including mirroring the troop structure by assigning incoming participants to patrols. The first three full days of the course represent the first three weeks of a troop calendar, complete with patrol leaders’ council meetings, troop meetings, patrol meetings, and planning for a big troop event. Participants use the full range of BSA resources for planning and conducting meetings that are interesting, lively, and relevant – a skill they can incorporate with great effect when they return to their home units. NYLT patrol members put their preparations to the test with an NYLT Outpost Camp symbolizing the big event that culminates a normal troop’s monthly program. The National Council of the Boy Scouts of America offers an advanced application course, NAYLE, held at Philmont. June 30, 2019 through July 6, 2019 at Winnebago Scout Reservation. Drop off will be at 8:00 am on Sunday and pick up will be at 12:00 pm on Saturday. August 4, 2019 through August 10, 2019 at Winnebago Scout Reservation. Drop off will be at 8:00 am on Sunday and pick up will be at 12:00 pm on Saturday. November 8-10 and 15-17, 2019. Course begins at 5:30 pm on Friday and runs through 3:00 pm on Sunday at Winnebago Scout Reservation. Registrants must attend both weekends. There is a required pre-course conference for parents/guardians, scoutmasters, advisors and participants. One of the best helpers for a Cub Scout den leader or Webelos leader is a den chief, a Scout who can help with activities, advancement, ceremonies, crafts, and other den events. But the best den chief is one who has attended Den Chief Training to learn about games, songs, tricks, puzzles, and other things that help a den chief do a better job. Pack Leaders: ask your local Scouts BSA troop to provide den chiefs. You won’t regret it! You’ll have better dens, and better Webelos-to-Scouts BSA transition results. Troop Leaders: being a den chief qualifies as a leadership position for rank advancement. Encourage your Scouts to volunteer, then sign them up for training! You’ll get more Cubs growing up to join your troop. Den Leaders: ask your pack leaders or troop leaders to help you get den chiefs. Webelos den chiefs are especially useful for teaching the Scouts BSA parts of Webelos advancement requirements and give the boys and girls a friend in the troop when it’s time to graduate. You will get a valuable assistant leader. Stay tuned for additional training dates! Valuable sessions for even the most experienced leader. ALL Cub Scout Leaders, Boy Scout Leaders, and Venturing Leaders –Including Youth Leaders. Childcare for your boys and girls, infant through 1st grade, will be provided by the Camp Fire Girls. 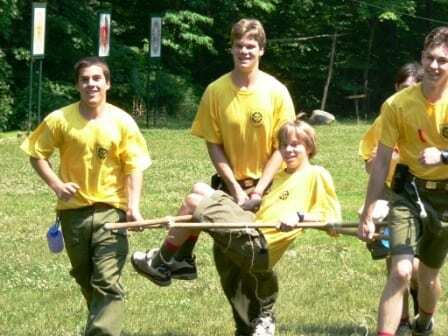 Cub Scout Program for Cub Scouts in grades 2-5, run by the Watchung Cub Scout Day Camp staff. Scouts, BSA, Venture Scouts and Sea Scouts may attend the U of S if they are taking courses as youth leaders/potential youth leaders. No children are allowed in the classrooms, except Scouts, BSA. Venture Scouts and Sea Scouts taking courses! Save the Date! Registration will open in September 2019. Check back for more information. Trainer’s EDGE is a train-the-trainer course which focuses on using the EDGE method to teach. This course is required for NYLT and Wood Badge staff members and can also be used to fulfill an approved ticket item for current Wood Badge members working on ticket items. Other trainers should be taking this course as a pre-requisite to teaching any other course. This course is also open to unit leaders. The certification is good for three years. Please be sure to have a prepared 10 minute presentation of your choice. Please check back for the announcement of the 2020 training date! It is time again for the course no one else offers. This course, developed by Scouters from our Council, is designed to increase your knowledge of the outdoors and the skills you need to keep your outdoor program exciting. Registration is open to youth that are 13 years old and Star rank, Venturers, and to registered adult leaders. Space is limited so sign up online as soon as possible. A letter of acceptance and a list of equipment required will be sent when your registration payment is received. An adult registered with their unit must accompany youth from a unit. Annual Health and Medical Record Parts A & B are required for this course! Participant Meeting: April 19, 2018 from 7-9PM. Wood Badge is Scouting’s advanced training course for all adult leaders: Cub Scout, Boy Scout, Venturing, Varsity, District and Council volunteers and professional Scouters. The training provides a common leadership foundation for all Scouters in the program. It gives multi-faceted presentations of leadership skills, organizational tools, and activities based on the best Scouting traditions and the latest in team development theory. You also will enjoy the fellowship of learning alongside many other volunteers and professional Scouters, and along the way have a great deal of fun. The Wood Badge program consists of two parts: Practical Training and the Application Phase. Practical Training is 6 days long, divided into two 3-day weekends. In addition, there are 2 patrol meetings held between the 2 weekends. These meetings are mandatory and are scheduled by your patrol at everyone’s convenience. Wood Badge is an outdoor experience where a Scouter lives as a member of a den/patrol/crew, practices skills in leadership, and learns how these skills apply in the role of the adult leader in developing youth through the Scouting program. Through living in this setting for an extended period of time, you develop a Scouting spirit and zeal for the program that motivates you to do a better job in the Scouting task you have accepted. During this Practical Training all participants develop a “ticket,” a written plan for how the Scouter intends to apply the skills and knowledge gained during the course in service to others, to specific goals and objectives in the Scouting program, and in personal growth. Application Phase is completed at home. Participants have up to 18 months to complete their “ticket.” Throughout this phase you will have a counselor who will act as a resource, Scouting friend, and evaluator. When the counselor determines that you have met the goals you established at the course and “worked your ticket,” you will be presented with the Wood Badge certificate, neckerchief, woggle and beads at an appropriate public ceremony of your choosing. The Fundamentals of Training is designed to help Scouters, regardless of their experience, present effective training. It will provide a great start for new trainers, show the BSA’s training techniques tothose who might have trained for other organizations, and help freshen up the skills of current BSA trainers. Existing Trainers, both youth and adult, currently serving on district and council training teams. This is the first part of the three-part train-the trainer continuum (T3 ) in Scouting and is intended for both youth and adult trainers. This session is designed to introduce new Scouting trainers to teaching techniques and skills. Most of the BSA’s instructor-led training is designed around a variation of what educators are calling the “team-based learning model.” Using small groups, team-based learning promotes learning and team development through frequent and immediate feedback by a facilitator/ instructor. It helps members learn from each other during and after the course. 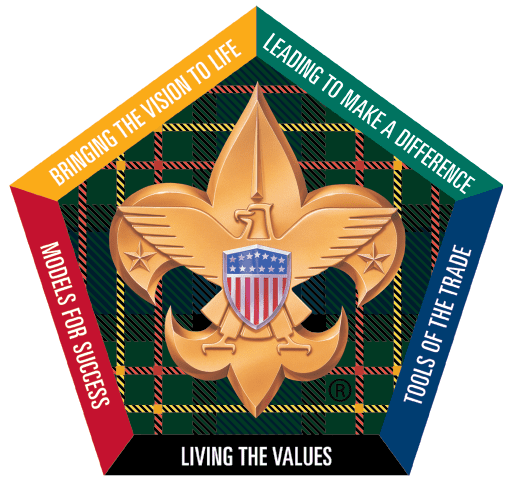 The teambased learning approach is similar to the patrol method Scouting has used for more than a century all over the world. The patrol method has proven effective in operating a den, patrol, squad, and crew, as well as in learning. We will use this method throughout the course. Upon completion of The Fundamentals of Training, new trainers will be able to apply the techniques they have learned across the BSA’s leadership development programs, from unitlevel youth leader training taught by youth for youth, to position-specific and supplemental training for adult leaders. Upon completion of this first part, new trainers are coached and mentored by experienced trainers as they become comfortable with and confident in their training skills. Trainer’s EDGE is the second part of the continuum. As trainers develop their training skills, Trainer’s EDGE provides an additional opportunity for trainers to enhance their abilities. Trainer’s EDGE also supplements the training development sessions offered during faculty development for advanced leadership training courses and increased familiarity with the EDGE model that is used throughout the training. The training awards and keys are designed to recognize unit leaders for tenure, training, and performance in their unit leader role. Progress record forms with the 2012 requirements for these awards can be found at the links below. Create a My.Scouting account to take Youth Protection and other BSA training. Every boy deserves a trained leader.